I hope that you have had a blessed and wonderful Christmas week. We started off the Christmas weekend/week hosting my families Christmas get-together. Normally we have this on Christmas Eve, but Stan asked that we do it the Saturday before allowing us some extra last minute shopping time if we needed it on Christmas Eve. I hadn’t planned on needing it, but an incident at a store on Sunday required me going out for a few hours on Christmas Eve; but more on that in a bit. First, our Family Christmas get together. I don’t know if I’ve stated this but I come from a family of six. That’s me and my siblings make four and my parents are the other two of our six When you add spouses and children, and newly children’s children (my oldest brothers daughter had a little girl in June) we are now at a total of 16-19 (depends on if the oldest is dating someone we’ve met and if she has offspring of her own). We decided to have just my parents and their offspring for this event; but had to include my Aunt Bell because she’s Aunt Bell and really people she’s like another mother to us kids. The way I feel about my Mom is the way I feel about my Aunt Bell. Besides her daughter and grandson live out of town and I wasn’t sure if she would be able to make it home, so we had to make sure she was with family during the holidays. We decided to have a non-traditional dinner (this was my husbands idea) and after my husband gave me an idea of what he wanted, I decided to make it into a theme. So we had more of a Southern Christmas dinner of: Gumbo, Red Beans & Rice, Fried Fish (Catfish & Perch), Fried Chicken, Fried Corn, (I’m feeling like we had a lot of fried stuff because I’ve typed it three times ), and Cheesy Garlic French Bread. For dessert I made a Praline Cheesecake, Cherry Cobbler, and White Chocolate Raspberry Cake. I realize now that I forgot to make the slaw. I had nuts and chocolate covered peanut butter filled pretzels, and a homemade chipped beef cheese ball for snacks. We had wine, soda, and Absolut w/cranberry juice to drink. It was a great night all in all. 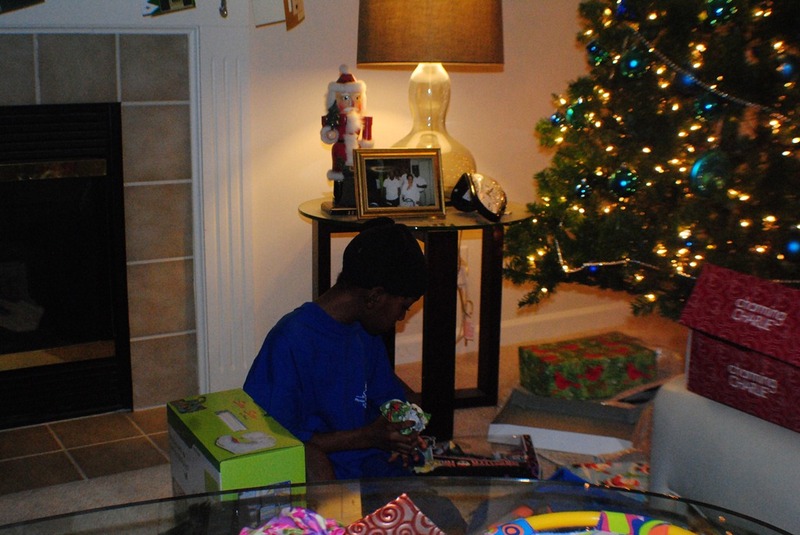 I love to see my mother open gifts as much as I do the kids, because she never expects anything and is always happily surprised. For Christmas, it was just the three of us; Stan, myself and the babydoll. We have always set in our household that babydoll gets gifts from Santa and Mom & Dad. Santa’s gifts come unwrapped (because he has so many homes to visit he doesn’t have time to wrap) and the wrapped gifts come from Mom & Dad. Since we now have multiple trees, Santa’s gifts go under the pink tree (think Pepto Bismol and not my purchase – Stan and his father thought it would be good for babydoll) and Mom & Dad’s gifts go under the real tree. This year it was a little difficult decided which gifts “Santa” was giving because we wanted to give all of the “major” gifts (it was more like we wanted the hi-fives. I mean isn’t why parents do away with Santa? They get tired of Santa getting the credit for everything.). In the end we split it up evenly. 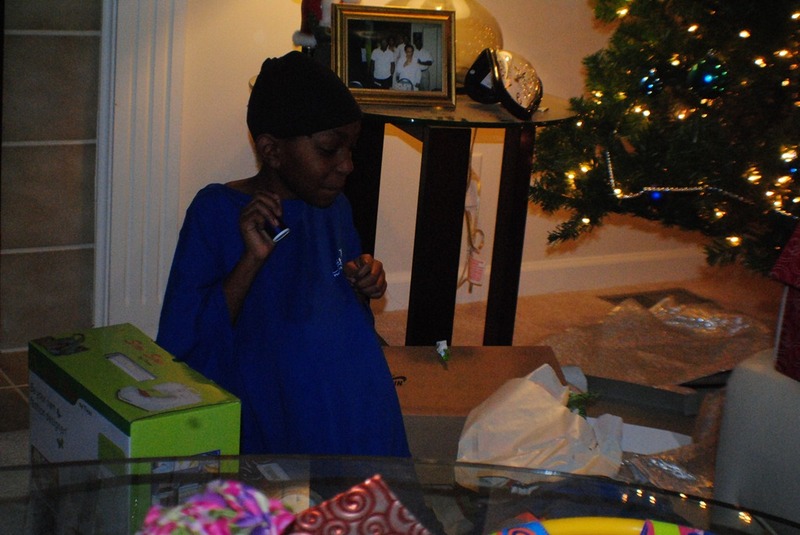 Babydoll was overjoyed with everything she received anyway regardless of who gave it to her. Can I say that I really love my kid? I mean even though she’s as sassy as they come and some days I want to shake her because of the grown stuff that comes out of her mouth; she’s a good kid. She’s not spoiled like some only children can be and she does appreciate everything. She completely understands if I say I don’t have the money for that right now or I refuse to pay an amount because it’s the asking price is unreal. I have a good, well mannered, well behaved kid and I’m going to take a moment to pat myself on the back. Later when I asked her what was the gift she was most surprised about, she said all of them. Mind you she asked for most of the gifts that she received; but she was still surprised none the less. I didn’t take a lot of photos because I wanted more video of the gift opening. Okay…back to Christmas. It was great to see babydoll go from one gift to the next throughout the day. It was great not having to rush to get dressed to be at someone’s home at a certain time for dinner (honestly folks I didn’t shower until around 2pm – I cooked breakfast and dinner in a nightgown and robe). It was a really peaceful day. The next morning I was due to return to work. Stan informed me right before bed that a blizzard was expected and he didn’t think I was going. I got up that morning and it hadn’t started snowing yet, so I thought I’ll go in for at least a half day. He stated telling me that I must be crazy to risk getting stuck out there and to forget it. 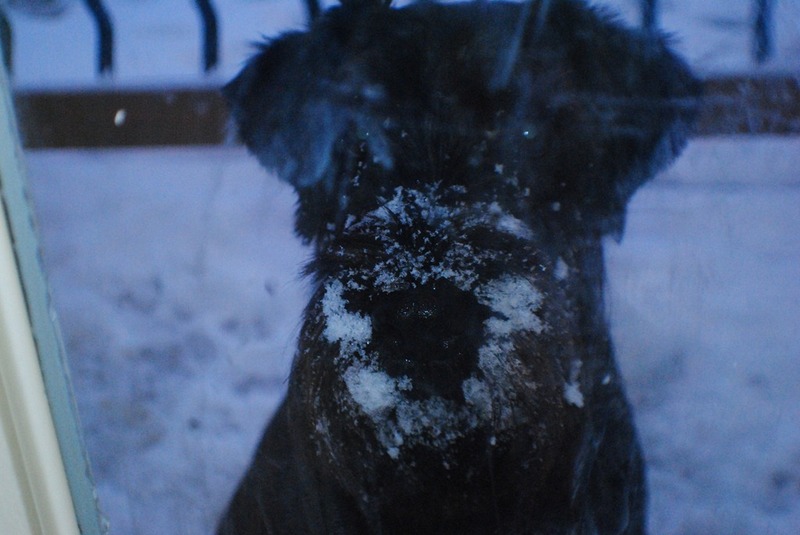 I watched the news weather (that was the news…the weather) and within the hour, the snow started coming down. And boy did it come down. Two hours later, we had significant accumulation and I had started doing laundry. 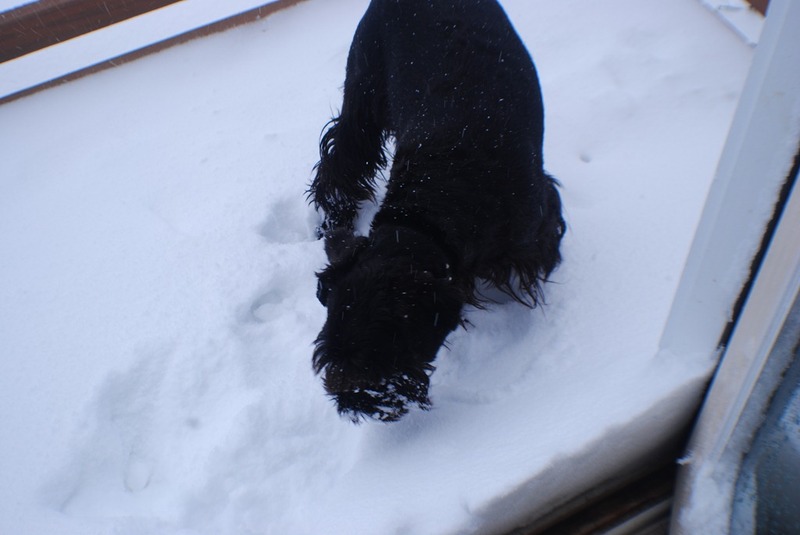 My Sasha was in snow heaven. 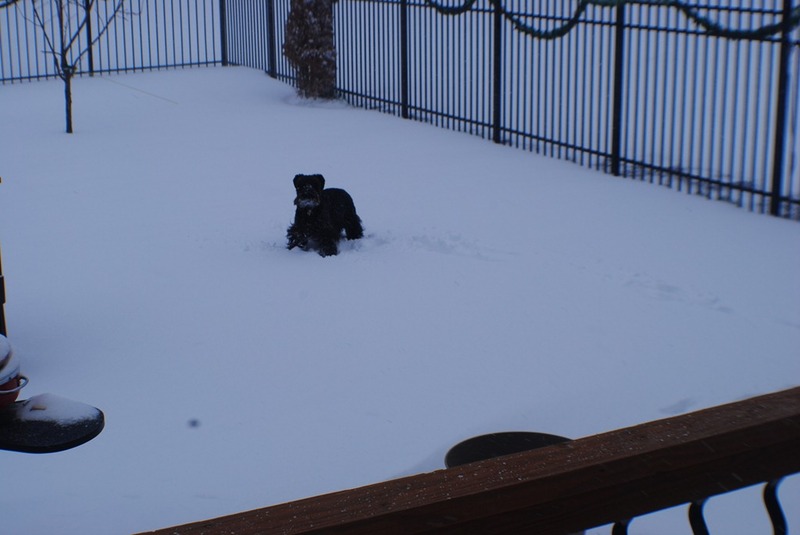 She kept going to the door to be let out and then she just raced around the yard sticking her face in the snow and running hopping around. It was a wonderful five days. Now it’s time to get ready for our New Years Eve/Day time. We don’t have big party plans, we usually hang out at home eat some bar food on the eve night, go to sleep at 11:45 wake up at 12:15 say Happy New Year and are back asleep by 12:30 then sleep in until about 11 am. We have a New Years dinner of Black Eyed Peas and Cabbage and Corned Beef for new year good luck and chillax watching movies. What about you? Do you have big plans?